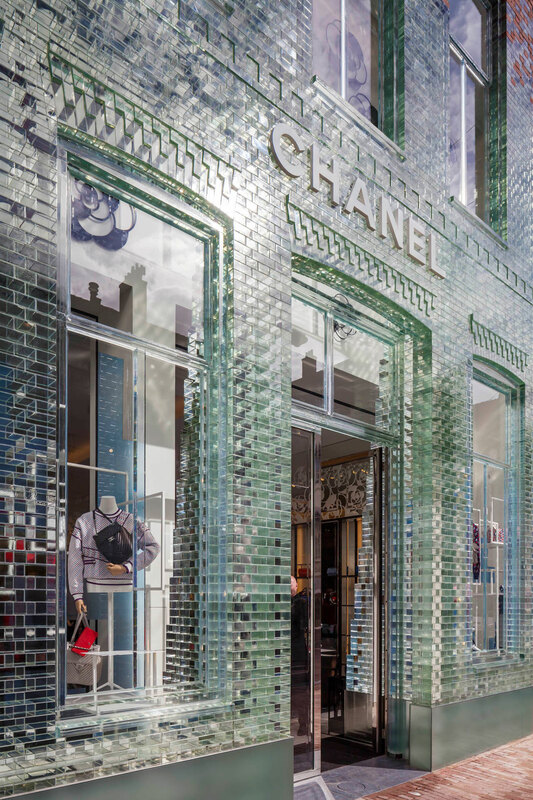 Jaw-dropping Crystal Facade of CHANEL Amsterdam Flagship Store by MVRDV. 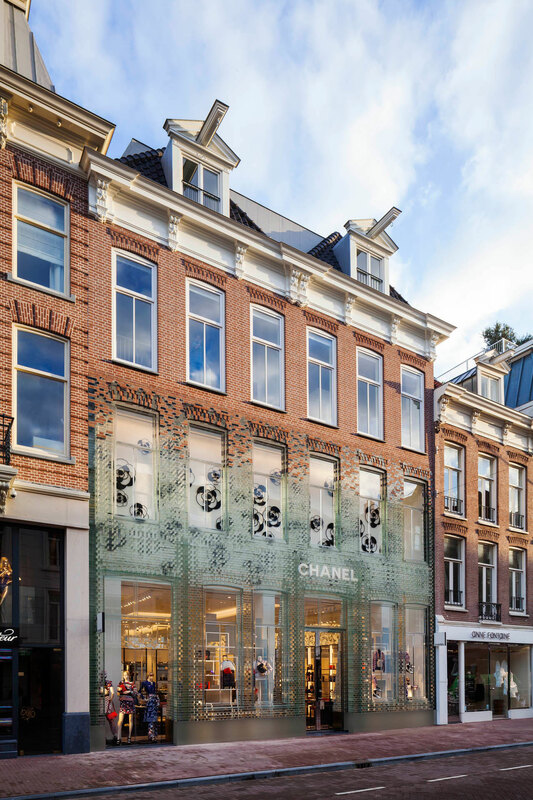 were commissioned to design CHANEL’s flagship store in Amsterdam, which saw the architects replace the original brick facade of a former townhouse with glass blocks, utilising cutting-edge glass technology. 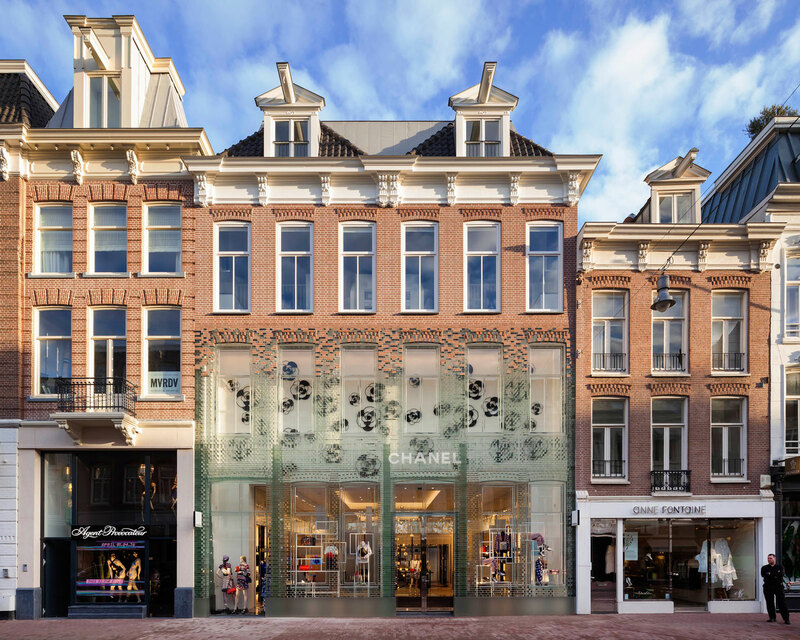 Located on the PC Hooftstraat, Amsterdam’s only luxury-brand street, the aptly titled ‘Crystal Houses’ project combines both Dutch heritage and international architecture. Six to ten experts worked every day for a whole year in a place that bore more resemblance to a laboratory than a construction site. Due to the sensitivity of the materials, an extremely high level of accuracy and craftsmanship was required and a technical development team was onsite throughout the process. Since this construction is the first of its kind, new construction methods and tools had to be utilised: from high-tech lasers and laboratory grade UV-lamps, to slightly lower-tech Dutch full-fat milk, which, with its low transparency, proved to be an ideal liquid to function as a reflective surface for the levelling of the first layer of bricks. 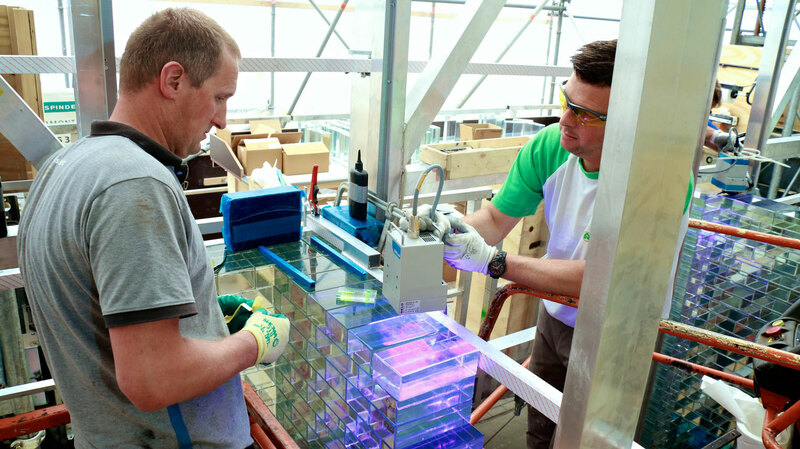 Despite its delicate looks, strength tests by the Delft University of Technology team proved that the glass-construction was in many ways stronger than concrete. 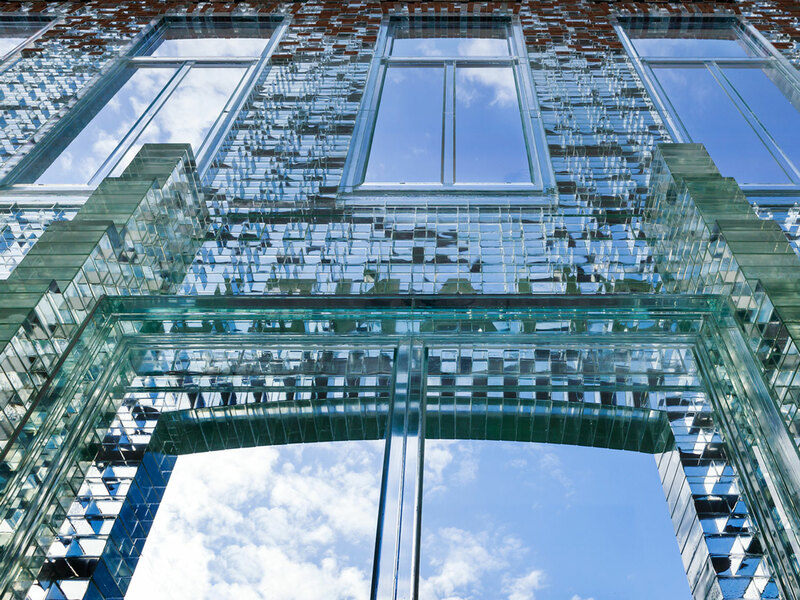 The full-glass architrave, for instance, could withstand a force of up to 42.000 Newton; the equivalent to two full-sized SUVs. The development of new construction methods unearthed additional possibilities for future building, such as the minimisation of waste materials. In essence, all of the glass components are completely recyclable. Waste materials from the project, such as imperfect bricks, could simply be (and were) melted down and re-moulded or entirely repurposed. Such is also true for the entire façade itself, once the building has reached the end of its life span, the whole facade can be melted down and given a new life. The only exceptions to this rule are added features which ensure the security of the building, such as a concrete ram-raid defence plinth, hidden in a blend of reflective and translucent materials and built to withstand the force of a car crashing into the building. Repair-protocols were developed in the event of any damage, allowing for the replacement of individual bricks. 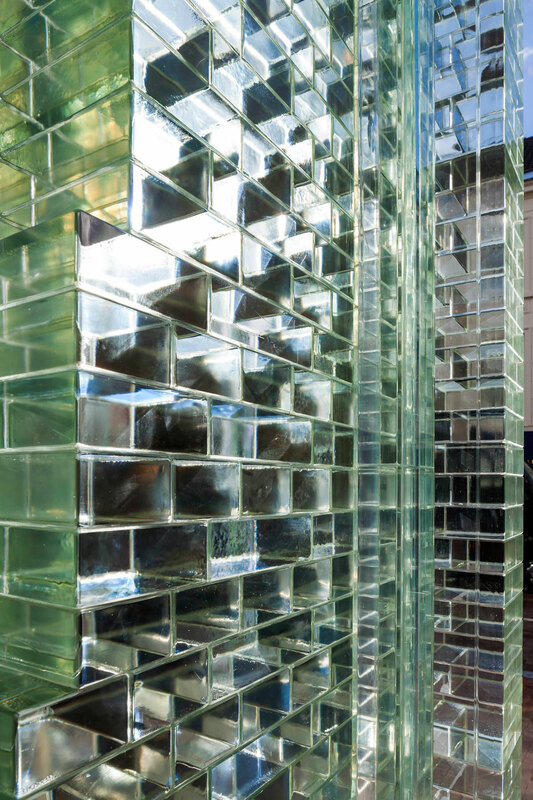 With a façade made primarily out of glass it was important to ensure that energy requirements were supplied through renewable sources. Therefore, the building was designed around a ground source heat pump, its pipes leading up to 170 metres underground, allowing for an optimal indoor climate throughout the year – a crucial element when dealing with delicate, sophisticated detailing while striving for a proper energy balance at the same time. Peter Zimmermann’s Immersive Art Installation With Coloured Epoxy Resin Floor. ‘Henri Martin’ Private Apartment in Paris by Laura Gonzalez. Sorry, but distance shot does not truly show, or highlight what was done to the buildings facade. Don’t mean to be harsh, but pehaps something shiney and bright on the upper floors of the building would fill the eye as you approch it on the ground.